Whether pounding the rock, running a non-Wildcat, throwing deep down the field or just being what we thought you were, there’s a storyline for each game on Saturday. Jackson Erdmann finishes the game with a separated shoulder and Mary Hardin-Baylor finishes with a pair of interceptions and a three-point win. And, as T.J. Josey says, it’s a game the Cru sorely needed. UW-Whitewater’s rock-pounding and defense has looked comfortingly reminiscent of the Warhawks of old. Like 2011 old or so. Meanwhile, Mount Union put Josh Petruccelli behind center and Muhlenberg couldn’t do anything about it. And Johns Hopkins looked fantastic on offense — enough so that Keith McMillan was ready to say something about the Blue Jays’ trip to Alliance. Pat and Keith talk about it all, first the high points, then all the points, in the latest D3football.com Around the Nation Podcast. 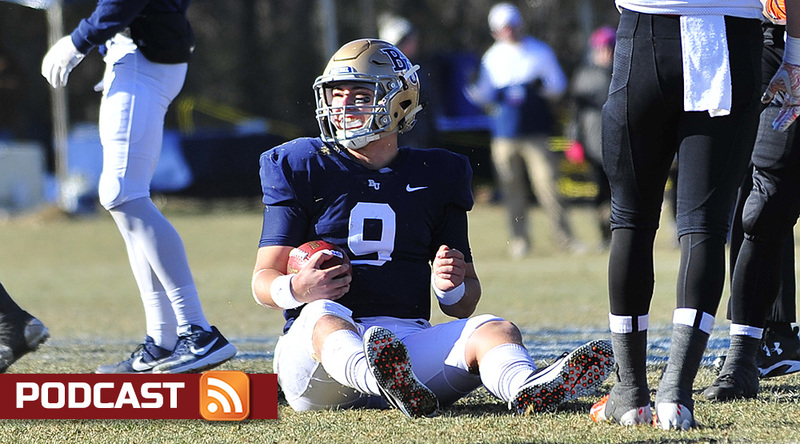 We’re down to four games, so it’s time to bring a little commentary back — here’s our take on the national quarterfinal games, with, perhaps, something resembling explanation. Keith McMillan, Ryan Tipps, Pat Coleman, Adam Turer, Frank Rossi and Greg Thomas each take their crack at it this week and every week from here to the Stagg Bowl. Photo: Jonel Reed streaking up the sidelines against Berry. 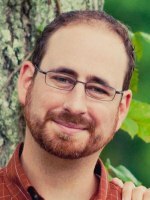 (Photo by Joe Fusco, d3photography.com). Keith’s take: Mary Hardin-Baylor 35, St. John’s 21. This is the Nos. 2 and 3 teams in the Top 25, so let’s just enjoy it. The Johnnies have the best quarterback on the field, but this will be the fastest defense he’s seen since the Big Ten. (It’s also No. 1 nationally vs. the pass, with 26 INTs and 4 TDs allowed.) 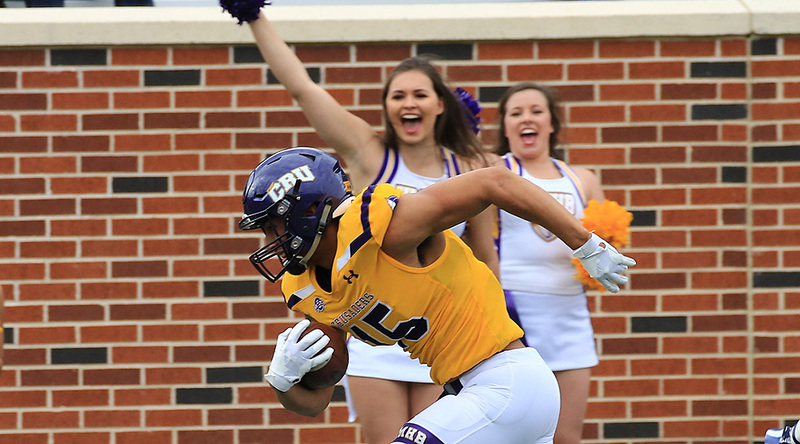 UMHB showed last week that not even its quarterback issues are actual issues, and I think the Cru plays its closest game of the year and gives up a season-high point total, and still wins with room to breathe. Ryan’s take: Mary Hardin-Baylor 35, St. John’s 24. There’s so much to be drawn to with the Johnnies returning to the level of play we saw in the early 2000s, but it’s hard to go against a defense that has only twice this year given up double-digits on the scoreboard (and only 15 points total this postseason). Despite early-season coaching drama and season-long quarterback shuffling, the Cru’s level of play has been absolutely crippling for its opponents. Pat’s take: Mary Hardin-Baylor 27, St. John’s 21. The biggest question for me is about the St. John’s defense, which gave up 609 yards of total offense to St. Thomas. They bent a whole lot, and they broke a little, in giving up 20 points, but picked off five passes. They’ll need to figure out a way to stop the UMHB run game, since the Cru could simply run them to oblivion. However, I do think that the Johnnies will score some points, and I’m looking for a game which is close at the end. Adam’s take: Mary Hardin-Baylor 43, St. John’s 42.The most exciting game of this round features two electric offenses. The Johnnies have the edge at the quarterback position, but can their defense keep up with the speed of the Cru? UMHB seems destined to play three more games in its home state, but faces its toughest challenge yet. Frank’s take: Mary Hardin-Baylor 24, St. John’s 21.The Cru jets out to an early lead, and it will be too little, too late in a comeback attempt by Jackson Erdmann and the Johnnies. 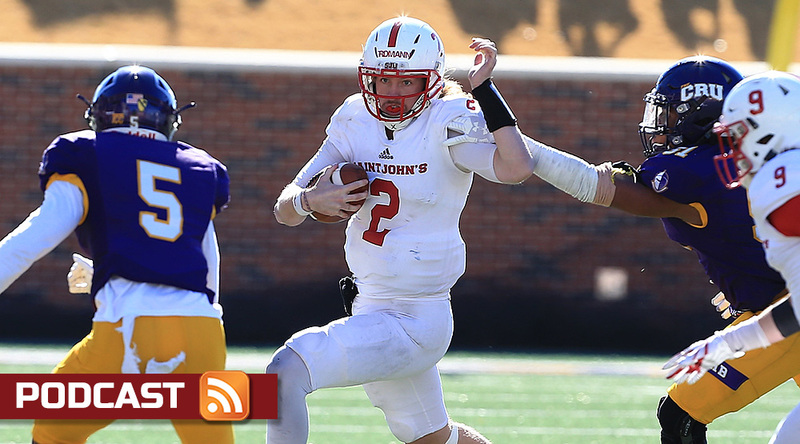 Greg’s take: Mary Hardin-Baylor 31, St. John’s 28.Can Jackson Erdmann find enough time and space to give the Johnnies a chance? I believe so. I also believe the Cru have enough offense of their own to outlast the Johnnies and advance. Hansen odds to advance: Mary Hardin-Baylor, 74%. Consensus: Mary Hardin-Baylor, but it gets closer with every prediction, so by Saturday, who knows? Keith’s take: UW-Whitewater 34, Bethel 24. This game might lack the flash of other matchups, but for those who like mauling lines, backs who keep their feet churning and teams who exude joy, it’ll be the best matchup of the quarterfinals. The Warhawks, for a team that won by 33 in Round 2, cut it close in several ways and will have to tighten up against the Royals, but ultimately they are too deep and too adaptable to any style of game to be worn down. Warhawks pull away late. Ryan’s take: Bethel 41, UW-Whitewater 38. I suspect I’m bucking my colleagues here, but Bethel has been so good over the past three weeks (averaging more than 400 yards of offense a game and putting so much pressure on opponents’ quarterbacks) that it’ll be hard to staunch that momentum. Pat’s take: UW-Whitewater 24, Bethel 15. Get all your rock-pounding right here. Or your smash-mouthing. Harry Henschler and Kyle Kilgore on each side will provide focus points for the opposing offensive lines, but hardly the only players worth noting on defense. I think points will be more at a premium because of the defensive performers and because of offenses that like to keep the ball on the ground. Adam’s take: UW-Whitewater 17, Bethel 10. Another matchup of similar styles. The Warhawks and Royals butter their bread with rushing and defense. This is going to be a classic Wisconsin-Minnesota slugfest. The Royals defense will need to keep it close, so that UW-W can’t force Jaran Roste into more passes than Bethel would like to attempt. Frank’s take: UW-Whitewater 27, Bethel 14. Rush defense has been both teams’ specialty this year, but the Warhawks will overcome the Royals’ ground-stop after Cole Wilber forces Bethel to diversify their defense. Greg’s take: UW-Whitewater 28, Bethel 10. This isn’t the Pound The Rock Warhawks of championship vintage, but the home side should be able to grind down the Royals at the line of scrimmage and inch away in the last 20 minutes. Hansen odds to advance: UW-Whitewater, 77%. Consensus: Non-unanimous, but UW-Whitewater in a relatively low-scoring battle. Keith’s take: Mount Union 45, Muhlenberg 14. In another matchup, I could see the Mules advancing again, but they’d need everyone on defense to play like Frankie Feaster and Nick Sirico to match what the Purple Raiders lineup brings. And then there’s the matter of the opportunistic Mount Union defense. Ryan’s take: Mount Union 49, Muhlenberg 14. There’s really very little stopping the Purple Raiders from getting back to the Stagg Bowl in a couple of weeks, especially seeing how D’Angelo Fulford performed being back under center. Muhlenberg has done admirably this postseason and should be able to use this as a springboard to better things in the coming years. Pat’s take: Mount Union 53, Muhlenberg 7. This presents an opportunity for the Purple Raider 2’s to earn back some trust with the Mount Union fans, regardless of their status with the coaches. Adam’s take: Mount Union 45, Muhlenberg 17. The Mules’ historic run ends here. Mount Union has too many weapons on offense even if D’Angelo Fulford is less than 100 percent. It might be close early, but the Purple Raiders will pull away with big plays from special teams and defense. The Mules have a deep and talented secondary, but have not seen wide receivers like Justin Hill and Jared Ruth. Frank’s take: Mount Union 47, Muhlenberg 20. The Mules will be able to keep this close for the first quarter, but little by little, Mount Union will pull away after wearing down a stalwart Muhlenberg defense. Greg’s take: Mount Union 48, Muhlenberg 10. Congratulations are in order to Muhlenberg on its historic run to the quarterfinals, but Alliance is where a lot of historic seasons meet their end. Hansen odds to advance: Mount Union, 95%. Consensus: Mount Union, by varying amounts of a whole bunch. Keith’s take: Johns Hopkins 38, RPI 24. On one hand, RPI just snuffed out a top-five team led by an all-American QB and the nation’s No. 2 defense. On the other, the Blue Jays just hung 58 on a Frostburg defense that was allowing 14.4. Even in the rain, I like David Tammaro and Co. to keep it going. Ryan’s take: Johns Hopkins 31, RPI 21. The massive second-half adjustments Hopkins made last week are hard to look past — that’s the kind of thing that sets great playoff teams apart. JHU has the tools to advance, but it will need to keep from turning the ball over so often as Brockport did against RPI in Round 2. Pat’s take: Johns Hopkins 31, RPI 17. Take that, state schools. Academic powerhouses for the win! (Well, Johns Hopkins for the actual win.) Looking for the JHU offense to be clicking in full gear on Saturday. Adam’s take: Johns Hopkins 31, RPI 14.The only unranked team still playing gives opposing quarterbacks fits. If David Tammaro can do what Joe Germinerio couldn’t and solve the Engineers, the Blue Jays will advance to the semis for the first time. Johns Hopkins is comfortable playing a high-scoring shootout, but does RPI’s offense have the power to keep up? Frank’s take: RPI 24, Johns Hopkins 21. The game sets up similar to the RPI/Brockport game, but on paper, Brockport had a slightly better defense than Hopkins. The turnover ratio gives RPI a narrow win, especially if it rains. Greg’s take: Johns Hopkins 35, RPI 17. RPI’s defense did a whole lot of bending last weekend, but survived several late pushes from Brockport. The Blue Jays are on an absolute tear right now and may well push the Engineers past the breaking point. Hansen odds to advance: Johns Hopkins, 91%. Consensus: Johns Hopkins, to everyone but the turnover beancounter. We’ve got one national semifi… no, sorry, four national quarterfinals, and we think three of them are shaping up to be pretty good, as RPI can certainly hold its own against Johns Hopkins, UW-Whitewater and Bethel should be a clash of similar teams and UMHB and St. John’s will give each other what should be the best test either of them has faced this year. Of the eight head coaches on the sideline this upcoming Saturday, two of them have particularly challenging jobs ahead, preparing for those toughest tests, and since we’ve already talked to Pete Fredenburg this season on the podcast, we sit down with Gary Fasching, head coach of St. John’s. He talks us through what a team has to do to prepare for not only a top-notch opponent, but a long trip, on Podcast 228. Pat, Keith, Adam Turer and Frank Rossi preview the four games, then Pat and Keith discuss them as well as we get you one complete hour of pregame coverage in your Game Day edition of the national quarterfinals on the D3football.com Around the Nation Podcast.